Now that the pressure is off to blog through Gattegno's textbook 1, we're actually enjoying math a little bit more as our lessons tend to be directed at what P. is ready to learn. The blog posts are going to take a different format as well. Instead of attempting to restate what Gattegno is doing in the books, I'm just going to be sharing what we are doing and how we are applying Gattegno (or whatever math we are doing) in our lessons and what we're learning along the way. Right now, we are working through compliments also known as number bonds and place value. P's came across the number 1,700,000 in a book about the Persian invasion of Greece and the Battle of Thermopylae. It's possible that King Xerxes had 1,700,000 men with him on the campaign. P. wanted to know how to say the number and this got us onto a conversation about what the zeros mean. Since we are already on the subject and he was interested, I thought we might introduce him to large numbers. As luck would have it, I'd just been reading about some work Gattegno had done with students involving large numbers and place value using their fingers. This exercise required multiple children. It's hard for me to get my hands on multiple kids at one time, especially during our school day. So, we had to improvise. After all, I didn't need the children, just their fingers. We made some hands, cut them out of card stock, and pasted them onto different colored construction paper. We used one set of hands per color for a total of four sets. If you try this, you will want to paste the the palms only to the paper as your dear sweetums will need to move the fingers back and forth from the fingers up position to the fingers down position. Once we pasted the palms to four pieces of construction paper, I divided the hands into two piles. Three sets of hands were in one pile and one set of hands was in the other pile. I asked P to take the pile with 3 sets of hands in it and cut one thumb (didn't matter which one) off each set of hands. This immediately caused both P. and dad to question my judgement. What was the point of making the hands with thumbs if we are just going to cut them off? Why are we cutting off a thumb? ​If we are cutting off thumbs, why not both thumbs? Why are we leaving the thumbs on one set of hands? Why just the thumbs? Why not more fingers? Can we cut off a finger instead of a thumb? And this question from P., "Does it bother you that you are instructing me to chop thumbs off hands? Do you really think that is OK?" I didn't answer but I was very happy about this line of questioning. Here was the awaresses I wanted to bring about. Each set of hands is one less than 10. ​There is a set of hands that equals 10. There is a reason for the 9 and the 10, even if P. didn't know what it was. ​ I smiled and asked, "Indeed, why ​did ​we cut off one thumb? And why have we left one set of hands with all fingers attached?" I lined up three of the sheets of hands in front of P. The first two sets of hands had nine fingers and the last set had 10. I moved some of the fingers from the up position to the down position. I then pointed to the one furthest left and stated , "When we read the fingers on these hands we will say the number of fingers up and then say 'hundred'." I pointed to the middle sheet and said, "When we read the fingers on this hand we will say the number of fingers that are up and then say 'ty'. If there is only one finger up, that is a teen number. You can say the teen number if you remember, but you can also say 'one-ty'." I pointed to the last set of hands and I said, "We will read this set of fingers as you normally would 1-10." This last set of hands had all fingers attached. This was his first informal introduction to place value. The first thing I wanted to do was get P. reading the fingers and using the proper language. I allowed him to randomly move the fingers from the up to down position on each set of hands and then read the numbers. I thought for sure this was going to be easy for him. But, of course, I was wrong. Conceptually, he got it. Of course he got it. It was the language that was a problem. We decided to shoot a video of his struggle. Once we got the language down, I asked P. to read not just the fingers that were up, but also the fingers that were down. We started on the first hand. Three up meant that there were seven down. 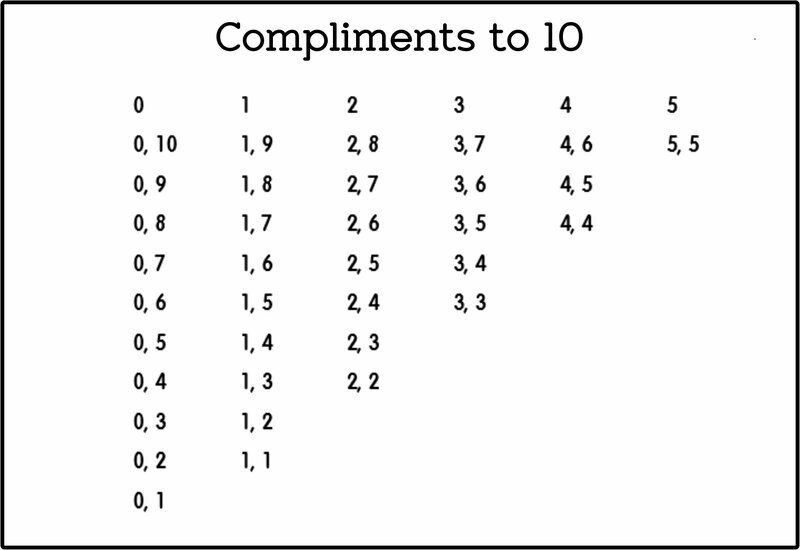 We noted that these are the compliments (number bonds) in ten. I added another set of hands. We read the various fingers that were up and then down, I noted that these are the compliments in 100. P. wasn't so sure about this. I could tell by the way he looked at me, but he didn't say anything. I didn't offer an explanation as I wanted him to think it through and form a real question. Waiting for him to think it through is important. We were only using two cards, he read the first card and then said "-ty". To get to a hundred you need a third card. How is it we are doing complements in 100? Why does one hand have ten? Are those questions related? How are they related? Can we play with the rods and find out? He didn't ask, I did offer. I'm waiting him out. Next came the 100 hands, I told him that we would be reciting compliments in 1000. I got another funny look and then he proceeded to move the fingers up and down and state compliments in 1000. The last set of hands on the right, we write the number bonds in ten. In all the other hands, we write the number bonds in nine. This is a very important observation and is going to come in handy as students progress in mathematics. The Vedic Sutra (rule), 'All From Nine And The Last From Ten' will be used to remove most of the pain from borrowing and regrouping in subtraction. I hate that algorithm and suspect we use it to just to torture small children. We will also use 'All From Nine And The Last From Ten' to make short work of the multiplication tables and make it possible to do rapid mental calculation. This is going to get interesting as we get into larger numbers. With nine hundred thousand, we have three names and I suspect P. will declare it so - a first, a middle, and last. Now it's a little more complicated. This is partly why I don't like teaching for understanding. All of us pick our own metaphors to help us make sense of quantity. It's different for everyone. I don't want to teach P. how to understand numbers, I want to provide him with the tools to sort numbers out for himself. I will correct when it is obviously flawed. The observation about first name and last name is the first inkling I received that P. is starting to develop some kind of awareness of the idea of place value. At this point, I could've had him memorize the places and their names. But I want develop this idea and let it ruminate for awhile. Maybe four years ago, I finally realized that numbers are marked off in powers of 10. Now of course I knew that. I could easily multiply and divide by 10 by messing around with the decimal point. I knew that nine is the highest number we can count to in any one place. But something was missing from my awareness. Playing with the rods one day it hit me, "Oh! These are powers of 10!" How did I miss it? I don't know. But I did. Therefore, I am reluctant to tell P. how any of this works. I want to put situations in front of him and draw these realizations out of him. Every time we move to a new set of hands, the numbers get a new name. This observation lays a solid foundation for place value. P's physical action of chopping off the thumbs of unsuspecting hands, drove the point home that the highest number we can have in any position is nine. I am not sure he will transfer this knowledge to written work; we will see when we write out these long numbers. We noticed that if we are working with compliments two numbers always go together. In ten, six goes with four. In nine, six goes with three. It doesn't matter if six fingers are up or six fingers are down. That should be obvious, you might think. Well maybe it is, and maybe it isn't. I've had enough light bulbs go on in the last 3 years, I try not to assume that anything is obvious and I realize how many basic concepts I've missed. I certainly can't predict how much is super clear in my child's mind. I don't even understand what is super clear in my own. Because, you know, I can't be aware of what I am not aware of. Even though there are various configurations of 3 up and 7 down, we only need two words to describe them (three, seven). By using the words three or symbol 3 we can take a lot of information about the sets of up fingers and down fingers and begin to organize it. Next task: Make a chart. I know that P knows the bonds to 10. If my end goal was that P. memorize the number bonds to 10, I would have skipped the chart. But that wasn't my goal at all. I wanted him to recognize that he could get to any pair of numbers by playing around with the sets. He only needs to know one pair of numbers on the entire chart and he could get to all the others by moving numbers in and out of the sets. Let's say I want to know what 3 + 7 is but I don't know it. How would I get there? Let's say I don't know 3 + 7, but I have 3 + 3 down. How can I get to 3 + 7 from 3 + 3? What mental transformations can I make so that I am always on sure footing? Perhaps I can add one to one of the threes. I know that 3 + 3 = 6 so 4 + 3 = 7 and then 5 + 3 must = 8 and 6 + 3 = 9 which means 7 + 3 must equal 10. Maybe I can skip count well by 2's. 3 + 3 = 6 and then 5 + 3 = 8 and 7 + 3 = 10. What is the point of this? There is so much happening with this exercise, I can't begin to cover it in one post. If you have played with Play Discover Learn's Permutations activity, you will catch a whiff of that activity here. There are multiple ways to show 2 up and 8 down. The awareness that a set of up fingers produces a particular set of down fingers and that those fingers can be reversed so that 8 up and 2 down correspond to 2 up and 8 down is developing the ground work for future work in combinatorics. It is a variation of the substitution game. By carefully crafting constraints when playing the substitution game, students learn how to transform any one number into other numbers by looking for how things are the same and how they are different. It is easier to do this with small numbers to build confidence and learn maths little secrets and then extend that knowledge to more challenging situations. Here is the kicker though: Because we did some of this earlier work, we went from working with numbers inside 20 to confidently working with numbers in 1000 in a half hour. I could have easily extended that to 1,000,000 or more if I had wanted to - but the dog needed a walk. Once the student develops an understanding of the structure, extending that structure is fairly painless and quick. Let's not forget 'All from Nine and the Last From Ten.' We will be using this quite a bit in the near future. If you want to connect with other folks who are using base-ten blocks to teach math we'd like you to join us. Since getting sent to Facebook Jail, I moved my math group to a new learning platform Learning Well At Home. You can join us there. I won't ask that you use your real name. We are still under construction. But you can post questions, get some answers, find weekly math challenges and I host all the PDF files from my blog over in the files section of the forum.